The internet as a whole is full of more websites, images, video, and data than anyone could possibly consume. Even if you look at the number of videos uploaded to YouTube daily, it would take more than a lifetime just to consume one day’s worth. With all of this in mind, the internet is also a digital playground for companies, brands, and individuals who are looking to market to users around the world. With social media, email marketing, content creation, and search engines all collectively providing marketers with all sorts of demographics and analytical data, it’s no wonder so many people are looking to market online. When most people think of digital marketing, they believe that it is mostly used for promoting e-commerce businesses. As necessary as it is for brands like Amazon and eBay, digital marketing is also an excellent way for everyday business owners to build their brand and expand their reach. However, too many business owners believe that launching a website is enough. When their site fails to gain traction, they often grow frustrated and revert to offline promotional strategies that had modest but consistent results. However, it wouldn’t take much time or effort to pivot any business or marketing model to rely more on data analytics and search habits, to improve ROI and engagement across the board. Selling online is something many people and brands think about, but not something many actually accomplish. All too often, the process is simply way too complicated or costly. This is something the platform Kajabi has not only mastered, but also made a successful business and community out of as well. Once you remove the complexities of starting an online business or course to sell, it’s then just a matter of knowing who your audience is and how to correctly target them. Again, through the use of self-serve advertising platforms and search marketing, this is simply a matter of test, learn, split-test, and then learn some more. Before all of that can happen, one must first go live with a platform or something to sell of their own. This where a solution like Kajabi comes into play. 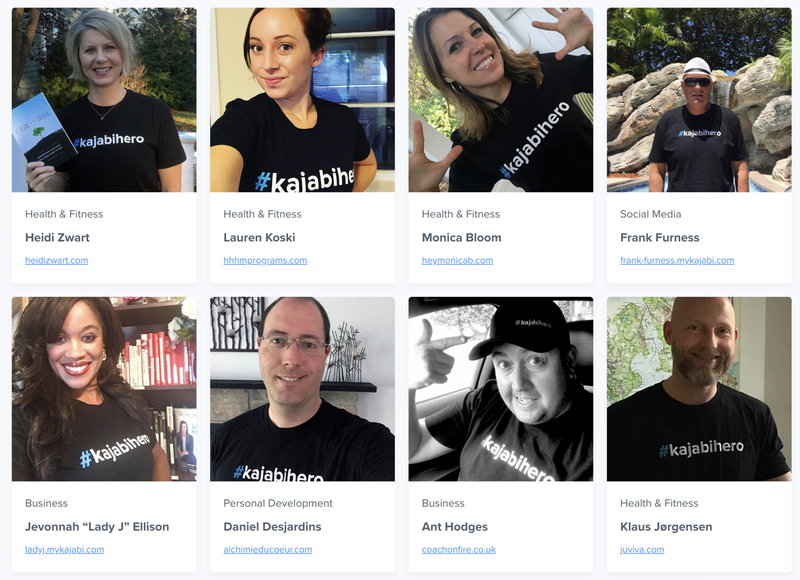 Not only have they created a solution for selling online, they’ve also built out a section of their site titled “Kajabi Heroes”, — which focuses on highlighting members who have earned their first $1,000 in sales online through selling through own courses or digital products. Through the use of online video, customer driven data, and analytics, not only have these individuals launched businesses and brands of their own, they’ve also learned how to become master marketers in the process. To help keep you inspired and destined for success, we wanted to highlight some of the most recent stories and case studies published to their site. No matter what niche market or industry you are currently in, be sure to read through each of the stories and highlights below to further improve your own online selling efforts and scaling your business to that next level. There are plenty of ways to make money with blogging, online courses, or even starting your own brand — but the best way to find success is to actually learn from others and follow what has previously worked for them. Here are some of the best examples of individuals finding success with their own expertise, video, and online courses, and how they are marketing to such audiences by using the demographic analytical data at hand. It requires consistent work. They would rather develop an online promotional strategy that they could run on autopilot. They don’t want to be viewed as sending spam, which obviously hurts their online reputation. Both of these concerns are invalidated by the fact that there are plenty of honest and highly effective email marketing strategies. The ROI of email marketing is around 4400%. Using your professional expertise is a great way to create a highly effective email marketing funnel. Dy Ann Parham is a fitness coach who uses the Kajabi platform to run her online business, while also focusing on email marketing to build her brand. She created an online course, which new email subscribers receive free access to. Her subscribers also receive weekly videos, which help them meet their fitness goals. Dy Ann has found that offering these incentives was a very effective way to generate a large number of email subscribers. Engaging with them in her email newsletters and weekly videos was a great way to brand herself as a leading fitness expert and get more clients. Billions of searches are made on Google every single day. All of this data is collected by Google, stored, analyzed, and then made available for advertisers to bid on. Advertisers won’t have direct access to this data, but they will know what keywords they are bidding on, along with the performance of each. It’s this time of analytical data and marketing that generates billions of dollars every year for the company. Businesses with an online presence depend heavily on organic search engine traffic from Google. Unfortunately, most business owners are not very tech savvy, so they often fall victim to scam artists that are offering to inflate their search engine rankings by offering useless services, such as adding meta tags or submitting their website to meet your search engines. Business owners that rely on these services get very frustrated when they don’t get any results after spending tons of money on their SEO. Business owners that understand the basics of SEO can increase their search engine traffic without hiring a professional. The best way to get more traffic from Google doesn’t require any technical knowledge at all. You simply need to get links from other reputable websites. The MPower Academy, another Kajabi Hero, is currently ranking for 65 keywords on Google, which is helping provide a steady supply of search engine traffic to their website. They have increased their search engine rankings by getting links from blogs that help people earn money at home, as well as other professional networking sites. As a business owner, you can learn from them. Try to build relationships with bloggers, influencers, local Chambers of Commerce, news sites, and other reputable sites that will help boost your digital footprint with Google. When it comes to creating a business both online or offline, too many people are focused on coming up with that new million-dollar idea or product. Instead of trying to come up with something new, why not use the power of data online and just research what existing audiences are looking for? It’s much easier to build a marketing campaign or business around this model than trying to reinvent the wheel. Cadaver Lab Workshop in Chicago is a Kajabi Hero that does a great job at this. Since they are medical professionals that are marketing their services to other physicians, they must provide detailed information on their professional credentials. Their homepage has over 2,000 words of content about their team, which goes a long way towards building trust. If that isn’t a perfect example of a marketing campaign focused on an existing need and driven by data and supply, I don’t know what is. Of the many different forms of data tracking online, split testing has to be one of the most exciting. Internet users tend to be very easily distracted. If you don’t provide a compelling reason for them to take an action, they are likely to click the back button and leave your site within seconds. This can make it difficult to sell products and services to new website visitors, even if you are not depending on interruption marketing strategies. It is easy to waste your entire PPC budget on a poorly optimized landing page. Breathe Your Passion is a Kajabi Hero that shows how to avoid this issue. They have created a very elaborately designed site with clear CTAs under their product descriptions. Below the fold on the homepage, they have two large images of people that want to learn about their pricing and private consulting policies. Under each of these images, they have a description of their services and pricing, along with a clear CTA button. Their website is well optimized for conversions, which is one of the reasons that this site has become so successful. People use the internet for many different reasons. One of the most popular reasons is to find information. The better the information that is put together by a website, the higher it will likely rank in Google. With that being said, one-page websites are virtually dead. Some one-page websites continue to thrive in 2018, but they generally are very rich in content. It is a lot easier to create a content rich site that occupies a number of pages. They are much easier to rank in Google. The Google Panda update in 2011 basically wiped out sites that were composed of thin content, such as Suite 101. This may seem dismal, but it is actually an advantage for companies that invest in good content. Customers are more likely to stay on content-rich sites and share them with their followers. With so many different SEO and tracking platforms available, creating the best content possible for both your audience and ranking in Google shouldn’t be that hard. Make sure that you invest the time in writing detailed articles and adding plenty of visual media. This will help you significantly. On the internet, data tracking and analytics is everything. It’s the difference between those who succeed and those who fail. With over a billion active sites online, it’s the one component that can give anyone the upper edge when it comes to marketing. The one thing that all of the success stories above have in common, is that they finally took action and got started with turning their passion or expertise into much more. Through the use of online course and business platforms like Kajabi, it’s easy for anyone to turn their skills or best information into a legitimate online business. No matter what it is you are selling, or have an interest in, it’s important to get started with a website of your own, grow your following on social media, and also package everything up in a text, a digital, or video-based course that you can sell. Once you have all of this in place, you can then put in the necessary time and research to better promote and market your course to the masses. The more niche-focused your product, and the better trust and authority you gain over time, the more likely you are to find long-term success with your online course or membership site. The best way to find success is to study the stories, case studies, and findings from others who have already done the same. Be sure to read through this article again and write down what made each of the entrepreneurs successful in their own niche market and industry.